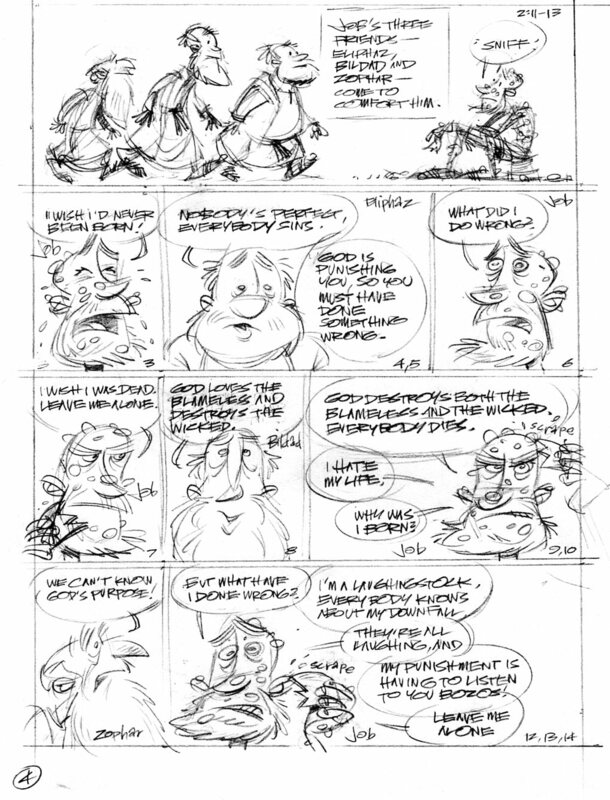 A couple of posts ago I told you I’m having trouble with the dialogue between Job and his comforters. Though I stick pretty closely to the conversation as it unfolds through Chapters 11 – 31 (each chapter gets summarized down to one or two short lines), there doesn’t seem to be a build-up to a punchline. For this to work as a comic, the tension should build to a climax just before the next scene, when a new character enters. One solution is to add some action, although there is none during this sequence in the Bible. I thought about how Job’s three comforters could literally beat up on Job while they interpret Holy Writ. I’ll have these scholars bring their scripture with them. I drew a quick sketch of Bildad hitting Job over the head with a scroll. I like it a little better than just heads talking for two pages. Could something like this work for my comic about Job? After letting this sketch sit awhile, I’ve decided I need to rework it. The content of the dialogue is a drastic shorthand of what’s in each chapter of Job—as if I tried to reduce each chapter to a single 140-character Tweet. So it more or less follows along with the book. All four characters say pretty much what they say in the Bible. But…it doesn’t feel right yet. It needs something. The conversation doesn’t lead up to a climax. I’m not sure what I need to do. 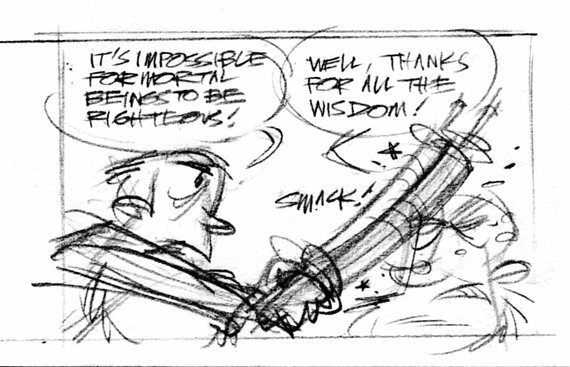 More from my Book of Job project—a sketch of Job’s pal Zophar who came to comfort Job in his hour of need. Job sits in a dung heap and scrapes at his loathsome boils with a potsherd (a piece of broken pottery), while he wonders where it all went wrong.